My best friend’s daughter is getting married in a week and I made her this little apron. I really like the “style”. 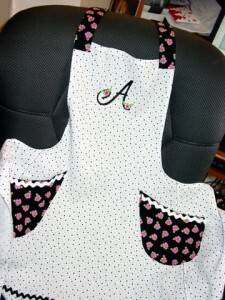 It’s McCall’s M5720 and comes with a matching little girl’s apron. 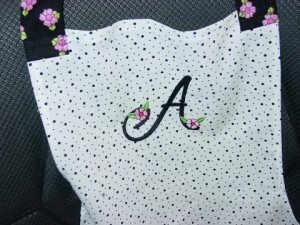 I might have to make this for some other family members again. It was fun to do. I tried to match the flowers in the print with my embroidery design and I think I got it pretty close – without actually copying the design. We all know that’s a “no-no”. Thanks for looking.